The 2018 World Championships, with world medals and Olympic births at stake, concluded on November 3 with the Chinese men and U.S. women claiming the team titles. In addition, 22 current, future or former NCAA gymnasts represented eleven different countries, bringing home medals, eponymous skills and record breaking performances. Alabama freshman Shallon Olsen had a successful world championships, helping the Canadian team place fourth in the team final while earning a silver medal on vault. Fourth place is the highest team finish ever for Canada at a world championships, and Olsen’s silver medal on vault is the first worlds medal of her career. Simona Castro, former Denver gymnast, had a solid day of qualifications at this year’s world championships to finish 55th out of 144 competitors in the all around. Castro was Chile’s lone female gymnast at this world championships. 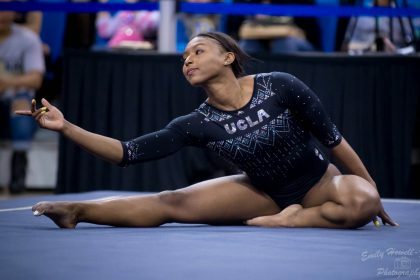 Needing all three gymnasts to compete the all around to record a team score, former UCLA star Danusia Francis helped the team place 42nd in qualifications. Despite an iffy bar routine, Francis produced the team’s highest score on each apparatus, finishing 71st in the all around. Mexican national champion and future Bruin Frida Ezparza recorded Mexico’s highest scores on bars and beam en route to a 32nd place finish in the all around in qualifications, narrowly missing out on the final. However, Mexico finished 19th as a team, qualifying a full squad to next year’s world championships. Future Alabama gymnast Corinne Bunagan was the only female gymnast at this world championships representing the Philippines. 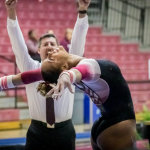 Other than a rough beam routine, Bunagan performed well in qualifications and showed lots of future potential for Alabama gymnastics with a 97th place finish in the all around. 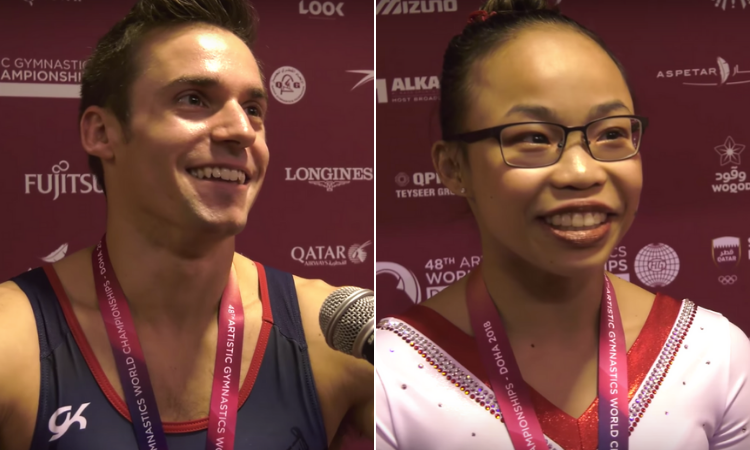 The U.S. team, with the help of three future NCAA gymnasts, qualified a full team to the 2020 Olympic games by winning its fourth consecutive world team title. Future Florida gymnast Morgan Hurd followed up her 2017 world all around title by winning the bronze medal in the all around at this year’s world championships. After placing sixth in the bars event final, Hurd added to her world championships medal collection by winning silver on floor exercise to conclude her championships. Another future Gator, Riley McCusker, placed eight in the all around in qualifications but did not advance to the final due to the two per country rule. However, McCusker performed well in the team final, improving her bars score from qualifications and redeeming herself from a fall on beam in qualifications with a hit leadoff routine. Grace McCallum, a Utah commit, performed well in her first world championships, hitting all of her routines in both qualifications and team finals. McCallum placed seventh on floor in qualifications but was unable to compete in the final due to the two per country rule. Vietnam’s lone female gymnast, North Carolina commit Tienna Nguyen, finished 79th in the all around at her first world championships. The highlight for Nguyen was her floor exercise, where she may gain an eponymous skill after debuting a new double turn in which she does one turn in L-position before completing the second turn in wolf position. The Australian team, led by Illini sophomore Clay Mason Stephens and alumnus Tyson Bull, finished 25th in the team standings. Australia will be disappointed in its finish, as it missed qualifying as a team to the 2019 World Championships by 0.104. However, Bull had individual success placing 11th overall on high bar and being one of the reserves for the final. Stephens placed 61st in the all around at his first world championships. Former California gymnast Yordan Aleksandrov, Bulgaria’s lone male gymnast at this year’s world championships, had a rough day in qualifying. The reigning MPSF high bar champion missed an opportunity to shine on his best event where falls took him out of event finals contention. Aleksandrov’s best performance came on pommel horse where he was able to finish 84th overall. Despite a poor pommel horse rotation where nobody scored above an 11.366, Canada was able to solidify a team spot at next year’s worlds by placing 18th overall. Penn State junior Sam Zakutney and former Hawkeye Cory Paterson both had strong showings with Paterson placing 70th in the all around and both performing well on high bar to help give the Canadian team the seventh highest scoring high bar rotation in qualifications. Former Penn State gymnast Franz Card had a solid day in qualifications to help Finland place 23rd as a team and qualify a full team to the 2019 World Championships. 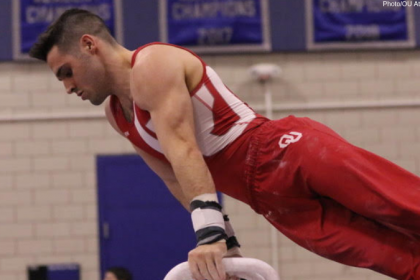 With no D-score higher than a 4.5 on any apparatus, Card executed his routines cleanly under pressure to produce respectable scores for his team that was able to put up only three gymnasts on half of the events, requiring a hit routine from each of them. Springfield junior Stephen Lewis was one of three gymnasts on the Jamaican team that placed 43rd overall. Lewis placed 92nd overall in the all around and second amongst the Jamaican team who all competed the all around to give Jamaica a team score. Vault was Lewis’ best event, placing 88th overall with a 13.800 on his Kaz full. Misha Koudinov, a former Buckeye, helped lead Finland to a 29th place finish in qualifications, less than two points away from qualifying as a team to next year’s world championships. Competing everything but vault, Koudinov had the team’s highest score on parallel bars as well as high bar. The U.S. men easily qualified a full team to the 2019 World Championships after placing fourth in the team final. While they were unable to win a medal and be one of the three teams to qualify for the 2020 Olympics from this event, the U.S. men exceeded the expectations of many by improving upon their team total from qualifications and going toe-to-toe with Japan for the bronze medal. Former Michigan gymnast Sam Mikulak led the team in qualifications, advancing to the all around final in third place while also making the event finals on floor, pommel horse, parallel bars and high bar. Mikulak anchored the U.S. on every event in the team final, with his only miss coming on pommel horse. A miss on high bar in the all around final yet again denied Mikulak an all around world medal, but he was able to redeem himself in the high bar event final, winning bronze—the first individual world medal of his career. Mikulak also placed fourth on pommel horse and parallel bars and seventh on floor. From qualifications to the all around final, Oklahoma senior Yul Moldauer was able to improve his score by over a point and a half to place 12th after qualifying in 19th. Moldauer was also strong for the U.S. in the team final, hitting all of his routines, including a stuck Kaz one and a half in the lead-off position on vault. In the floor event final Moldauer came just 0.034 short of defending his bronze medal from last year while having the highest execution score of the final. Akash Modi, a former Stanford gymnast, had a mixed-bag of a world championships. Modi fell on pommel horse in qualifications while also missing on parallel bars in qualifications and the team final. However, in the team final, Modi delivered a hit on still rings while also drastically improving on his high bar routine from qualifications, hitting when it mattered most. After falling on his second vault in qualifications, former Sooner Colin Van Wicklen missed the vault final after hitting a powerful Dragulescu first vault. Van Wicklen performed well in the team finals, nailing another Dragulescu while delivering hit lead-off routines on both floor and high bar. Ohio State senior Alec Yoder was capable of contending for the event final on pommel horse but unfortunately suffered a fall on the event in qualifications. Yoder was able to come back strong for the team final, redeeming himself on a critical pommel horse routine that was his only event of the day.